Ever since I first ate etouffee I was enamored. I am used to curries, but this dreamy creamy concoction grabbed a special place in my repertoire of favorites. And it was the first time I ever heard or ate crawfish, which I assumed from the name that they would be fish-like. I was pleasantly surprised that they resembled shrimp, more than fish. I dug up the history and you name-it everything I can find about an etouffee and was impressed how simple it was. But only (slightly) turned off at the amount of butter it requires!! I could not put it off for too long though, when a craving for some etouffee hit me. I had to give in to my temptation, to keep the engine running. So I turned to my dust collecting cookbooks, especially The Dooky Chase Cookbook. I bought this book when I heard about this restaurant extolled on TV. Well to be frank, many of the recipes did not jump at me because each involved a ton of butter AND deep frying. I don’t usually attempt deep frying as all rules of moderation fly out of the window if there is fried food around me. However, there are some classic southern comforts, that I cannot wait to try. Overall it was an interesting read with unusual recipes like squirrel pie and turtle stew. I made etouffee earlier, but something was missing (no, I don’t skimp on the butter). 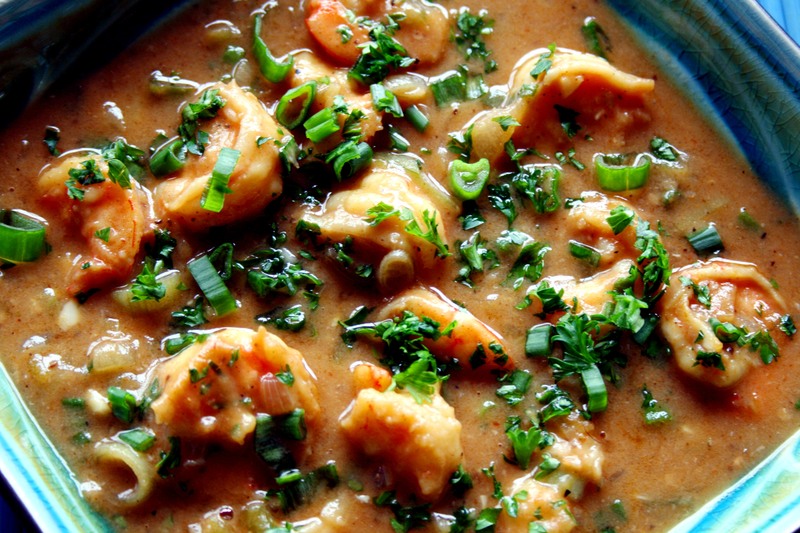 I read somewhere that the key to etouffee was shrimp stock, although the recipe in the book did not call for it. So I went all the way out, got whole shrimp and made stock–which made the whole difference. It is irreplaceable and worth all the extra effort (of my soux chef, aka husband) in peeling and deveining the shrimp. 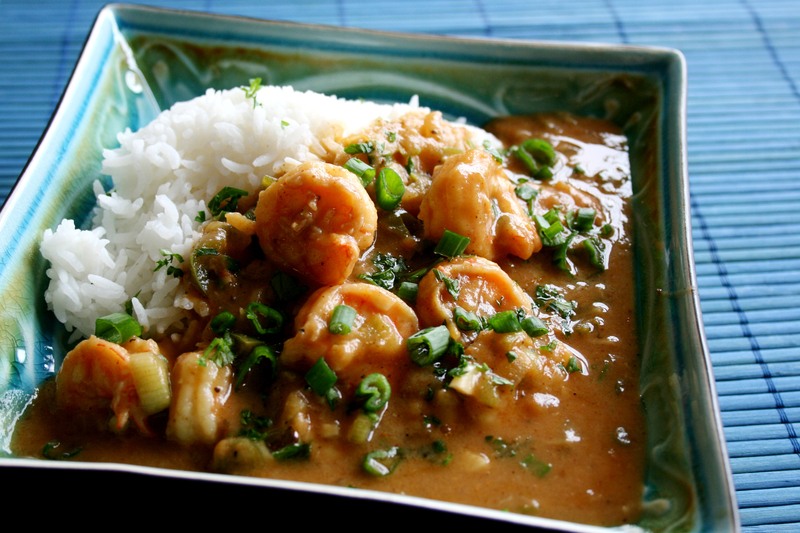 My etouffee is adapted from the book with some intuition and substitues. Here we go. Add all the ingredients for stock to a pot and bring it to boil. Once boiled turn down the heat and simmer for 45-60 minutes. Let it cool and strain through a fine mesh seive. This will make around 3 cups of stock. Heat a non-stick pan on medium and add oil and butter. Once butter is melted add the flour and cook it for 5-6 minutes to make a golden colored roux. Keep an eye on this as the golden color can quickly turn into darker brown and nuttier tasting. I prefer golden colored (or blonde) roux. Add 1/2 cup shrimp stock and incorporate the flour mix breaking any lumps. Add rest of the stock and simmer for 10 minutes, while occasionally stirring. Add salt (shrimp stock is already salty) and adjust to taste. Add shrimp, hot sauce and spring onions and simmer for another 10 minutes, until the desired consistency is reached. Taste to adjust any seasonings. Garnish with parsley and spring onions and serve it smothered over hot cooked rice. Don’t forget the beer! 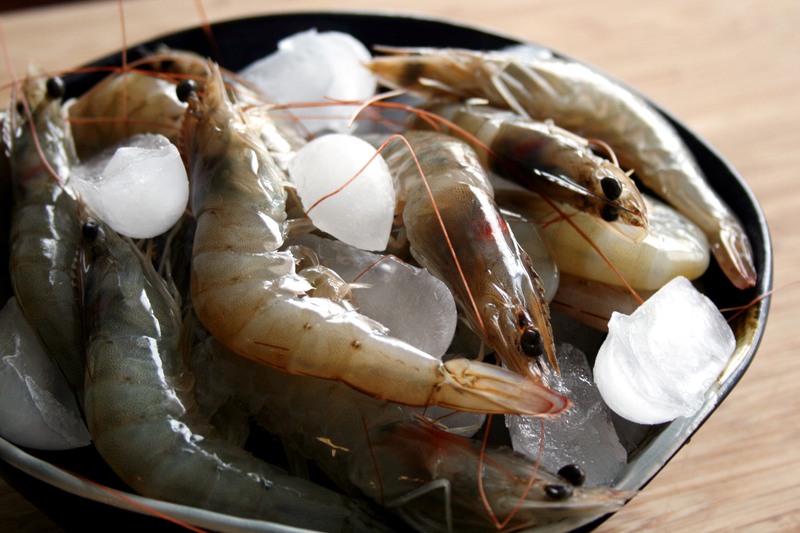 This entry was posted in Recipes and tagged Shrimp, Southern Comforts. Bookmark the permalink. Beautiful photos, and looks so delicious. I’ve got that cookbook, too (or at least I did … I lose track) and ate at the restaurant years ago. Glad to be reminded of Leah Chase and glad to see (thank you, google) that she’s still going at 89! You ate at that restaurant!!!! I am so jealous 🙂 Its on my to do list when I go there. I am sure you’ll love it!! I’ve never had etoufee before but have seen it on cooking shows and it always looks so yummy. Never thought of trying it with shrimp since I’ve never seen crawfish here. Thx for sharing! Asiya, shrimp is perfect int his..and even here its hard or me to find crawfish.